The Smith Island Baking Company, Inc. (SIBC) was founded in 2009 on Smith Island with a simple mission: to share Smith Island Cakes with the world. In doing so, we sought to benefit our bakers and employees, Smith Island, Crisfield, and broader Somerset County. Our story has been told and retold by satisfied customers and journalists alike from around the world. It's a story of the right people, the right vision, and the right community. And, of course, the right cake! 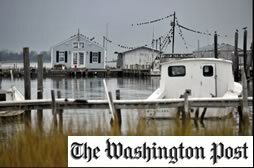 Smith Island, Maryland, is a 400-year-old fishing village of only 250 residents. 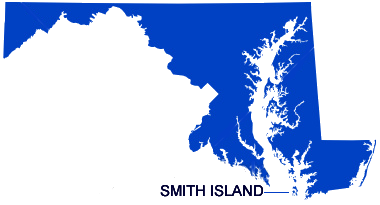 Located 10 miles offshore in the Chesapeake Bay, and accessible only by ferry, it was here that the Smith Island Cake was born. 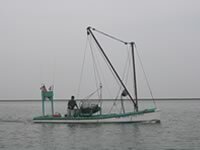 Smith Island has always been a waterman's community. In the 1800's, when Smith Island men went on the autumn oyster harvest, their wives would send Smith Island Cakes as a special treat to remind them of their families and the community they had left behind. 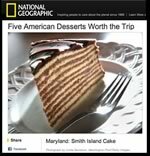 The bakers took pride in making Smith Island Cakes with the thinnest possible layers and they began using fudge instead of buttercream frosting. The watermen loved the presentation, and cakes frosted with fudge lasted much longer than cakes with other frostings. In 2008, Maryland named the Smith Island Cake its State Dessert. In spite of the island's remote location, National Geographic says we're "Worth the Trip." In 2009, Brian Murphy, a former commodity trader turned entrepreneur, partnered with local bakers to create a premiere national gift company right on tiny Smith Island. Brian grew up on Maryland's Eastern Shore, only 50 miles from Smith Island. In 1999, he graduated from the University of Maryland with a degree in Economics. He spent the next decade as a Portfolio Manager for Constellation Energy in Baltimore. In May, 2008, Brian graduated with an MBA from the University of Pennsylvania's Wharton School. In December, 2008, Brian decided to set out on his own, dreaming of starting a company. In 2008, Murphy created an investment company, the Plimhimmon Group, named in honor of his late father, and he spent several months exploring everything from cement companies to lumberyards to clothing designers. But nothing felt quite right. 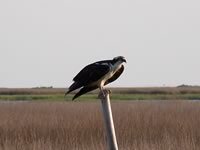 As fate would have it, in February, 2009, Murphy and his family were on the way to visit his mother on the Eastern Shore for her birthday. On the way they stopped at a local market, and bought a birthday cake. A Smith Island Cake. Everyone loved the cake, but Brian was surprised to learn there were no bakeries on Smith Island. Could there be? The logistical hurdles were many, and they were obvious. But the idea of a premier gift company shipping cakes all over the world from the tiny island was too interesting to pass up. So the due diligence began. In April, 2009, Murphy met with local bakers in the Tylerton church basement and the Smith Island Baking Co. was founded. The women called the idea, "an answer to prayer". They began building the company from scratch. The web site, the shopping cart, new logos to capture the spirit of the island, custom packaging, cake tins, and a refined, made-from-scratch recipe were just the beginning. Word of our little bakery quickly spread. Just six months after opening our doors, we were overwhelmed by the Christmas demand and we had to turn away customers! We grew from shipping a few cakes a week, to a few dozen... to a few hundred! Before we knew it, we had shipped cakes to all 50 states, and more than 2,500 cities in seven countries. 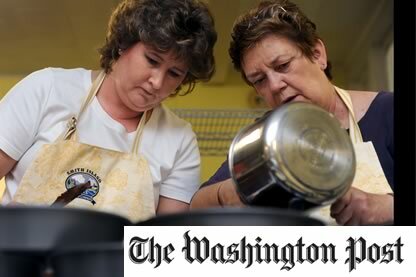 We had secured our place as the premier baker of Smith Island Cakes and as a growing national gift company. As the company grew, and our number of retail customers grew, we also landed some of the most prestigious wholesale accounts, including Neiman Marcus, Hammacher Schlemmer, Nordstrom Cafe, Oriole Park at Camdan Yards, Harris Teeter and QVC. The demand quickly outpaced the tiny bakery on the island's capacity, and expanding on the island was impossible. While the ferry could only ship 150 cakes a day, on a good day our customers would order more than 1,000! To meet demand, we opened an additional bakery in Crisfield in 2013. Crisfield is the closest town to the island, and the place from where the daily ferry arrives and departs. SIBC also partnered with Brian's childhood friend, acclaimed Chef Jordan Lloyd of Easton's Bartlett Pear Inn, who serves as our Chef de Cuisine. Chef Jordan is famous for his farm to table fare, and he launched our ice cream program, trained our team, and created several wonderful cakes for us. Chef also made sure our operations, food quality and food safety metrics were consistent with industry standards. SIBC's commitment to our employees and to Smith Island is second only to our commitment to our customers. In 2015, we came to the conclusion that the limitations and logistical hurdles associated with operating a commercial bakery of the island could negatively impact customer experience. We love our customers, and our employees agreed we could never let that happen! We consider ourselves to be custodians of a treasure, and we take that stewardship extremely seriously. For that reason, SIBC consolidated all commercial operations in Crisfield. To stay true to our word, while serving our customers, we offered to pay the ferry fare for those employees who wanted to work in the Crisfield facility during non-summer months. The Smith Island Baking Co. has had a wonderful first seven years, and we look forward to a brighter tomorrow. Smith Island, Crisfield, and Somerset County are special places in Maryland history, and in United States history. At the Smith Island Baking Co., we are excited by the financial impact we continue to have on the island and Somerset County. 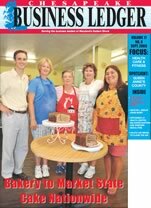 From all of us at the Smith Island Baking Co., thank you for taking the time to read the story of our company and the Smith Island Cake. We hope you'll consider trying one of our made-from-scratch Smith Island Cakes at your next event, and we look forward to serving you and your loved ones soon.